Posted May 5th, 2015 by Rhys & filed under interview. 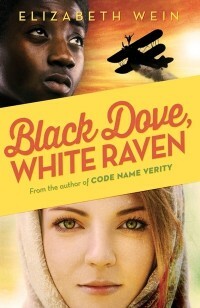 It is a pleasure today to welcome Elizabeth Wein, author of the brilliant Young Pilots series that includes Printz-honoured book Code Name Verity review, Rose Under Fire review and now, Black Dove, White Raven review. I’d like to start by asking what your inspiration for Black Dove, White Raven is. I know that’s such a wishy-washy question; I guess I want to know how you ‘discovered’ the story of Teo, Emmy, Rhoda and Delia; how did you first stumble across the idea to set this novel in Ethiopia in the 1930s? Well, three of my earlier books are set in 6th century Ethiopia, so in doing research for these I acquired plenty of information about 20th century Ethiopia, and I knew about the Italian invasion. I was doing research about early female pilots and discovered Bessie Coleman, who in addition to being the first black woman to gain a pilot’s license was in fact the first American, man or woman and black or white, to gain an International Pilot’s License. One thing led to another with the research: I became interested in African-American pilots, and discovered that two of these (both men) had gone to assist Ethiopia during the Italian invasion. The seed for the story was there. So then I had to populate it with characters of my own. Delia’s prototype was native Ethiopian and Rhoda’s was Scottish, and she’d grown up on a farm in East Africa (she was kind of based on the early woman pilot Beryl Markham). But then my film agent – of all people! – suggested that I make them both Americans who have moved to Africa, to give my Western readers a bit more familiarity and grounding with their background, as I did with Rose in Rose Under Fire. And that turned out to work very well. Em and Teo developed because they were really the main characters – all the rest was backstory! I started with a girl and boy about the same age, both learning to fly, both devoted to each other. The rest grew with the story as I wrote it. In the story, Rhoda is a notable photographer; I thought perhaps that you had seen some photographs of Ethiopia and that had inspired, in part, the story. Is that just wishful thinking, or do the photographs you describe really exist? Well, I wanted her to have a couple of money-making schemes and I had read an interesting book about early aviation photography so I put those together. Those photographs she talks about don’t really exist. However, the magazines she talks about, and the kind of ethnic (possibly romanticized) photographs described in the glossy book that Em and Teo like looking at, and the angle that the magazines take towards printing her photographs, are not invented. She would, for example, be likely to get $200 for a photograph of an “Abyssinian Shepherd Boy” printed in Vu. It is true that I have spent a long time poring over old photographs of Ethiopia… But not so much aerial photographs. Though there is some fascinating cine film footage on the Pathe website! Your last three books have often been about (frequently female) young pilots. In Black Dove White Raven, you also have African pilots; including Teo. Given that female and African pilots were somewhat of a rarity, does that feel forced? Are you searching for stories about historically under-represented characters? It really didn’t feel forced to me at all – it was my research about early female aviators that put me on to early black aviators (again, in the person of Bessie Coleman), and I am absolutely fascinated by their struggle to be allowed to share the sky. In the context of Ethiopia, this is historically accurate. Haile Selassie wanted his air force to be made up of Ethiopian pilots. He was forced by necessity to hire white Europeans to train his young aviators, but where possible he also drew in black aviators from other countries, such as Hubert Julian and John C. Robinson. Haile Selassie’s vision eventually resulted in the founding of Ethiopian Airlines in 1945, which currently flies to more destinations than any other African airline. Hmm, am I searching for stories for historically under-represented characters, interesting question! No, I think that what happens is I am fascinated by the bigger picture, and then as I explore it I discover little-known stories that I feel must be told. With Rose Under Fire, I always knew that part of the story would take place in the Ravensbrück concentration camp, but I didn’t know a thing about the medical experiments on the Rabbits, or about their resistance within the camp, until I started the research. And then I wanted to tell their story. With Black Dove, White Raven, I knew I was going to set the story during this period and I knew I wanted to have flying in it, but I didn’t know much about the aviation background. Late in the research I even discovered that there was a young Ethiopian woman training with the Imperial Ethiopian Air Force in the 1930s, which gave me the idea of teaching the character Sinidu to fly, too! In Rose Under Fire and Black Dove White Raven, your main characters are displaced Americans, like yourself. How has your own relationship with the USA influenced that? My characters all tend to be travellers, which is certainly how I perceive myself. With Rose Under Fire and Black Dove, White Raven, the “American” nature of the characters is probably more consciously generated by a potential American readership than by my own origins. Originally I’d intended the Rose character to be English and the American characters in BDWR to be Scottish or native to East Africa. Having made the decision to make Rose, and the Menottis, American, it was useful to draw on my own background to flesh out their characters. HOWEVER, it is very true that my characters tend to be displaced from their national origins, and this is very much a characteristic where my own life is reflected in my novels. It’s most obvious in A Coalition of Lions, my second book, which is my first novel set in Ethiopia, but which is told through the eyes of a British teen who has emigrated. “Foreignness” is definitely a theme in Code Name Verity, too, with all the main characters in the French setting coming from elsewhere. It’s also easier, for sure, to write about a culture and a setting you’re unfamiliar with when your viewpoint character is also an outsider. I don’t feel I could accurately write a novel set in Ethiopia from a native point of view – or, for that matter, a novel set in France or Germany from a native point of view. 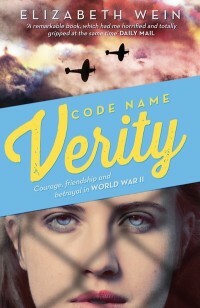 However, I do feel comfortable making my viewpoint characters British – as in Code Name Verity and my earlier novels. I don’t think I’ve fully tapped the potential for my being American in fiction – there’s probably more to come! One final question, because I’m conscious of the lengthy answers you have already given (and I want to save some questions if/when I ever meet you in person! ): what are you working on right now? Hahahahaha, I could tell you but then I’d have to kill you. No, seriously, I’ve never actually been given permission to announce my next work, though I probably could get it if I asked for it. But I do tend to be so very uncertain about my ability to deliver the promised goods that I don’t like giving a lot of detail until I’m closer to being finished than I am. It is a YA mystery, and it is set in the second quarter of the 20th century but not in wartime, and it is set in Britain. There isn’t any flying in it. It might be a total disaster. I’m enjoying writing it. I have always wanted to try my hand at a real mystery. Thank you so much for your time, Elizabeth. I look forward to the surprise mystery! Thanks so much for being such an enthusiastic reader, and for this interview! 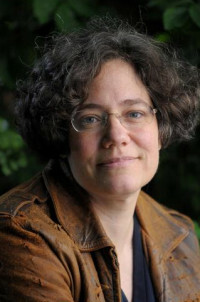 What did you think about Elizabeth Wein: Ethiopia, Flying and “Foreignness”!? Wow! Fab giveaway! I was lucky enough to hear Elizabeth talk about these books and she is an amazing lady!